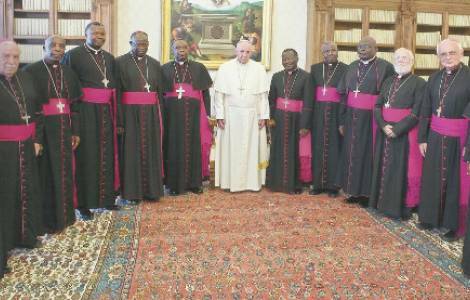 AFRICA/CONGO - Bishops' appeal to the Countries in the north of the world: "Help us to recover money unfairly stolen from our development"
Bishops' appeal to the Countries in the north of the world: "Help us to recover money unfairly stolen from our development"
Brazzaville (Agenzia Fides) - Corruption, poor management of oil revenues, lack of dialogue between majority and opposition, an unjust international system of economic exchanges and debt financing: these are the causes of the profound political, economic and social crisis in which the Republic of Congo lives. This is what the Country's Bishops say in the message published at the end of the extraordinary session of their Assembly, which was held in Brazzaville from 8 to 9 May. The Bishops say they are "deeply convinced" that the difficulties that have afflicted the Country for at least three years derive from the reform of the Constitution that was not shared by the opposition. "In a democratic regime, no reform that provokes strong tensions and protests has ever brought benefits to the people, and consequently a change of the Constitution in the division would endanger social peace" the Bishops warned in the 2014 Christmas message, recalled in the document sent to Agenzia Fides. In 2015, a constitutional referendum sanctioned the adoption of a new Constitutional Charter that allowed President Denis Sassou Nguesso to compete in the 2016 elections, which he won despite strong protests by the opposition and a part of the population. "What can we say about the crisis in the Pool?" the Bishops ask, referring to the South-East Department "since 1998 regularly shaken by crises and armed conflicts" which, despite the numerous peace agreements and demobilization of the combatants, continues to live in insecurity and violence. The Bishops underline that in order to resolve the crisis in the Pool it is necessary to bring to light "its causes and consequences, but above all the responsibilities of each and every one". At an economic level, the population is starving. "The fall in the price of oil does not explain everything" say the Bishops, who wonder how the huge profits in past years were managed, and why the State negotiated debt agreements that are so unfavorable for the public coffers. As a result wages are not paid, the health and education systems are shattered, food prices continue to rise, "except for beer".